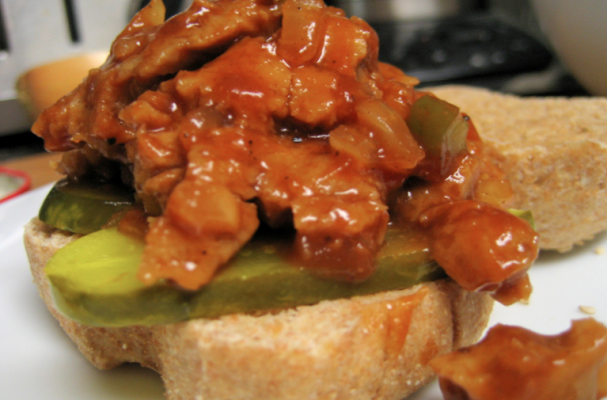 Barbecue season is almost here and this delicious seitan and mushroom barbecue sandwich is a recipe you won't be able to live without. This classic Southern dish has been modified for vegetarians and vegans. Shredded seitan is combined with slices of mushroom and onion before it is tossed in your favorite barbecue sauce. This meal comes together in minutes and should be served with your favorite coleslaw. Step 1: Heat the olive oil in a saute pan over medium high heat. Add the onion and cook for 5 to 7 minutes until softened. Add the garlic and continue to cook for another minute. Add the chopped mushrooms and stir to combine ingredients and continue cooking for another 5 to 7 minutes. Step 2: Add the barbecue sauce and mix ingredients until well coated. Turn the heat down to low and cook vegetables for 10 minutes, stirring occasionally. Step 3: Remove mixture from heat and fold in the seitan. If the mixture appears dry, feel free to add some more barbecue sauce. Step 4: Serve hot on rolls with sliced pickles and coleslaw.